The Fitness Ball That Does It All! The io-ball’s unique elliptical shape forces your body to work hard the complete our specially designed online workouts. 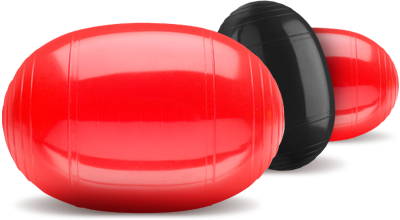 The award winning io-ball is compact enough to bring anywhere, effective enough to use in all your fitness activities. Get started now with our diverse and growing collection of both quickie and full workouts at special prices – all with our 30 Day 100% MONEY BACK GUARANTEE! Online Workouts For Every Fitness Goal! The io-ball is the perfect home fitness workout. We have developed and produced a complete collection of workouts for all your fitness goals – Toning, Sculpting, Cardio, Weight Loss, Strengthing, Balance and Coordination, Body Awareness, Stability and Posture, Explosive Power, Upper Body, Lower Body, Back Core, Booty, Stretching and Conditioning. Follow along as global io-ball experts show you how to unlock the benefits derived by training with such a unique, ground breaking fitness tool. Learn not only about the benefits of elliptical training from the very people who developed the program, but workout right alongside them as they show you how to explore the many routines, exercises and benefits of the io-ball and the io-ball programming. We offer online workout subscriptions and individual workouts. Join thousands of people who have already begun training with the latest fitness sensation! Unique Features and Benefits of io-ball. 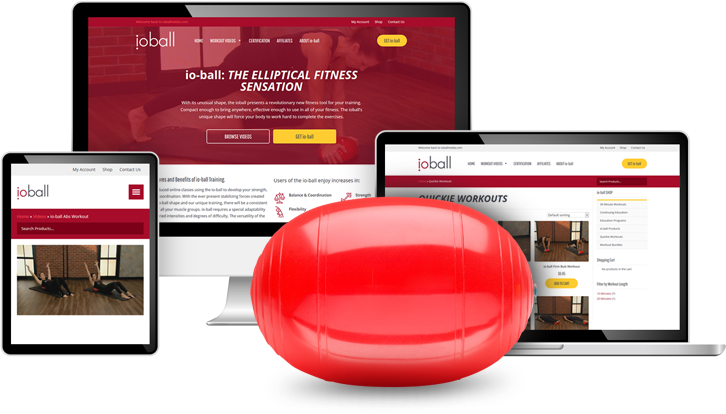 We have produced online classes using the io-ball to develop your strength, balance and coordination. With the ever present stabilizing forces created through the io-ball shape and our unique training, there will be a consistent interaction of all your muscle groups. io-ball requires a special adaptability that offers varied intensities and degrees of difficulty. The versatility of the io-ball offers unparalleled training opportunities in fitness, sports, rehabilitation and the treatment of chronic weaknesses. Signup for our newsletter to receive io-ball updates. Looking for a great gift for the fitness and wellness enthusiasts in your life? How about giving them an io-ball online gift card so they can select the products, online workouts and classes they love using the gift amount you send. Are you a fitness professional looking for the next tool to take your business to its next level? Then look no further, learn how to train others using the groundbreaking technology and fitness programming of the io-Ball. We understand you are busy. Now you can learn around your schedule at your computer.